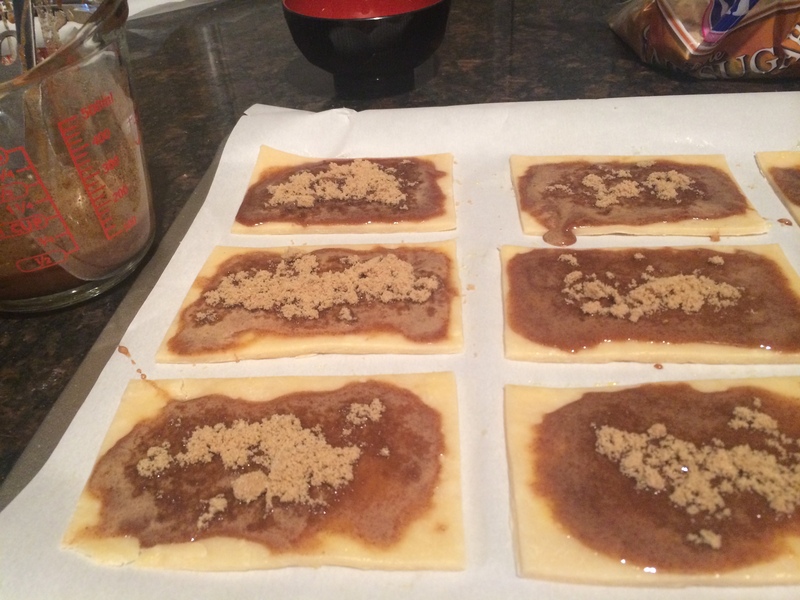 You guys… I made delicious, homemade cinnamon brown sugar pop-tarts last weekend. From scratch! Don’t mean to brag, but I considered it quite the accomplishment 2 days and 4 hours of baking time later. And, they were SO worth it. I know, I know, you’re thinking… what? Why the heck would you put that much effort into making something you can buy in 10 seconds at the grocery store??? My answer is this: No “Fake Stuff.” No Preservatives. Fresh. Delicious. Goodness. Want to try them yourself? (You know you do) I’ve got the recipe below. P.S. If you want to save a lot of time (and effort), buy some pre-made pasty dough. Just be sure to get the good stuff that’s fresh. I got my recipe from Sally’s Baking Addiction. She has a great description with photos of how to make these things. I did things a little differently, but they turned out great! The Pastry: Mix flour and salt together in large bowl. Add the butter and shortening and use two forks (or a food processor) to blend the mixture until the butter and shortening is in small balls. Slowly add the cold water to the mixture until it forms together into dough form. Roll the dough on a floured surface and split in half. Then flatten each half into a disc shaped circle. Wrap each half tightly in plastic wrap and store in refrigerator. (Cool for at least 1 hour) I made the night before and stored over night. Assembly: Remove one of the chilled dough discs from the fridge and let it sit at room temperature for 15 min. When the dough is ready, (take the other disc of dough out to get at room temperature, first) then roll the dough that’s ready out onto a floured clean surface with a rolling pin. Roll into a rectangle about 9×12 inches. 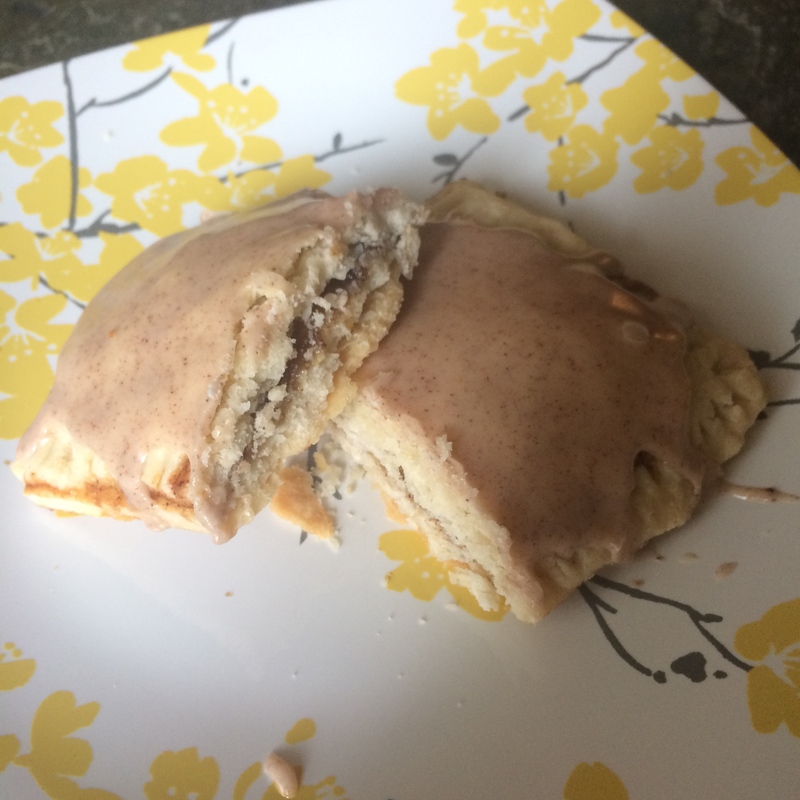 This was not as easy as it looked in the pictures, and my pop-tarts definitely did not turn out in perfect rectangles, but you don’t have to be a perfectionist here… just try to make it close :) Once you have it rolled out, cut into even rectangle. you should be able to get 9 rectangles. I used a pizza cutter to cut the dough, and it made it really easy with a super clean cut. 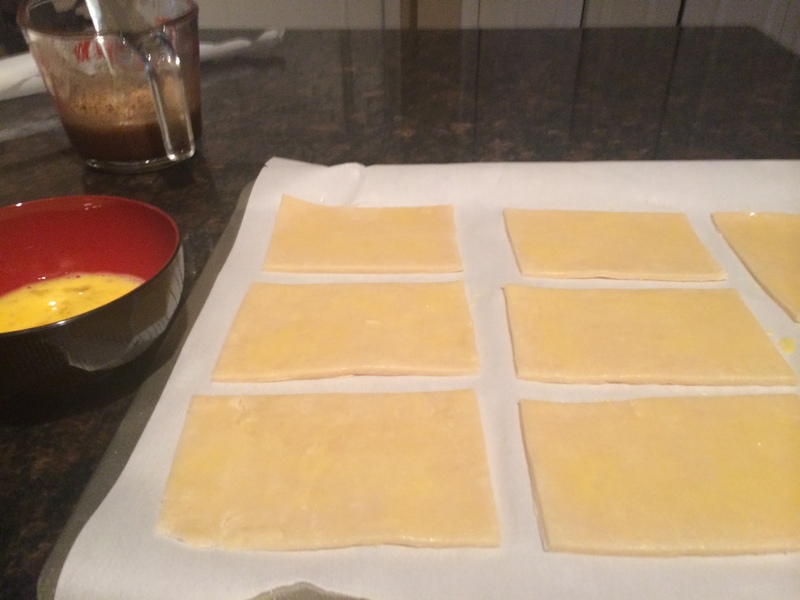 Once done, place the rectangles on a parchment lined baking sheet and place back in fridge. Now it’s time to do the same thing with the second disc. Place on baking sheet and back in the fridge. The Filling: This is the simplest step! To make the brown sugar filling, just combine the brown sugar, cinnamon and flour in a bowl. To make the egg wash, whisk one egg and 2 tablespoons milk. Now take the bottom rectangles out of the fridge and brush with egg wash. Now it’s time to pile your filling on. Make sure to leave some space on the edges to seal the pastry dough together. After that, take the other sheet of dough out and brush them with egg wash. Place top pieces over bottom piece egg-wash side down. Poke holes in the top to allow it to breather and seal edges with a fork. Place assembled pop-tarts in fridge to cool for 20 minutes. 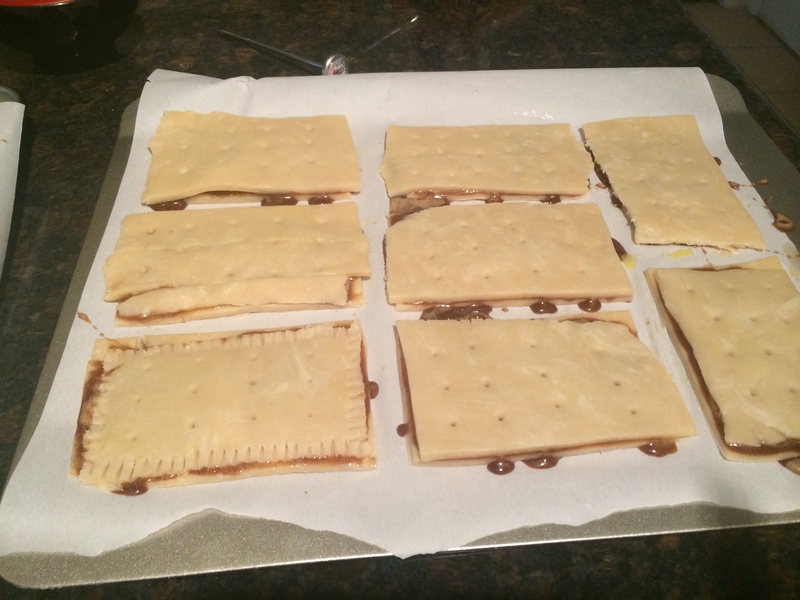 When oven is ready, place pop-tarts in oven and bake for 22-28 minutes, until golden brown. The Icing: To make the frosting, combine all ingredients and whisk. The glaze should be thin, but not so runny that it won’t stay on top of the pop-tart. Final Touches: When the pop-tarts are done baking, let them sit on the baking sheet for 5 minutes before transferring them to a cooling rack. Let cool completely before applying icing. After I put the icing on, I placed them back in the fridge for about an hour to cool and set. Hint: These babies are even better the next day! Not-So-Pinterest-Perfect photos of the process below.